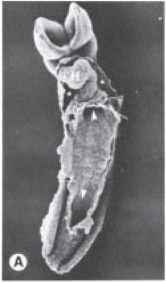 Figure 10.1 A. Transverse section through an embryo of approximately 19 days. Intercellular clefts are visible in the lateral plate mesoderm. B. Section through an embryo of approximately 20 days. The lateral plate is divided into somatic and splanchnic mesoderm layers that line the intraembryonic coelom. Tissue bordering the intraembryonic coelom differentiates into serous membranes. (cephalic, caudal, and two lateral) responsible for closing the ventral body wall at the umbilicus fail to progress to that region. Another cause of these defects is incomplete development of body wall structures, including muscle, bone, and skin. Cleft sternum is a ventral body wall defect that results from lack of fusion of the bilateral bars of mesoderm responsible for formation of this structure. In some cases the heart protrudes through a sternal defect (either cleft sternum or absence of the lower third of the sternum) and lies outside the body (ec-topia cordis) (Fig. 10.3 A). Sometimes the defect involves both the thorax and abdomen, creating a spectrum of abnormalities known as Cantrell pental-ogy, which includes cleft sternum, ectopia cordis, omphalocele, diaphragmatic hernia (anterior portion), and congenital heart defects (ventricular septal defect, tetralogy of Fallot). Ectopia cordis defects appear to be due to a failure of progression of cephalic and lateral folds. Omphalocele (Fig. 10.3B) is herniation of abdominal viscera through an enlarged umbilical ring. The viscera, which may include liver, small and large intestines, stomach, spleen, or bladder, are covered by amnion. The origin of omphalocele is a failure of the bowel to return to the body cavity from its physiological herniation during the 6th to 10th weeks. Omphalocele, which occurs in 2.5/10,000 births, is associated with a high rate of mortality (25%) and severe malformations, such as cardiac anomalies (50%) and neural tube defects (40%). Chromosomal abnormalities are present in approximately 50% of liveborn infants with omphalocele. 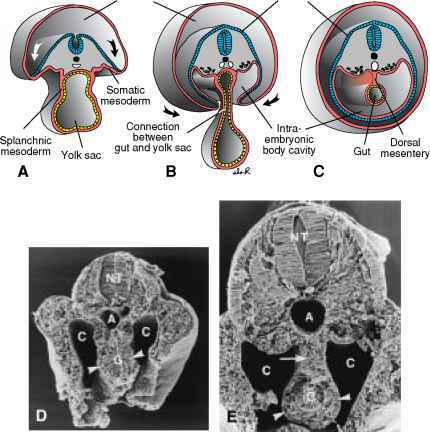 Figure 10.2 Transverse sections through embryos at various stages of development. A. The intraembryonic cavity is in open communication with the extraembryonic cavity. B. The intraembryonic cavity is about to lose contact with the extraembryonic cavity. C. At the end of the fourth week, splanchnic mesoderm layers are continuous with somatic layers as a double-layered membrane, the dorsal mesentery. Dorsal mesentery extends from the caudal limit of the foregut to the end of the hindgut. D and E. Scanning electron micrographs of sections through mouse embryos showing details similar to those in B and C, respectively. G, Gut tube; arrowheads, splanchnic mesoderm; C, body cavity; arrow, dorsal mesentery; A, dorsal aorta; NT, neural tube. usually on the right, through a region weakened by regression of the right umbilical vein, which normally disappears. Viscera are not covered by peritoneum or amnion, and the bowel may be damaged by exposure to amniotic fluid. Both omphalocele and gastroschisis result in elevated levels of «-fetoprotein in the amniotic fluid, which can be detected prenatally. Figure 10.3 Ventral body wall defects. A. Infant with ectopia cordis. Mesoderm of the sternum has failed to fuse, and the heart lies outside of the body. 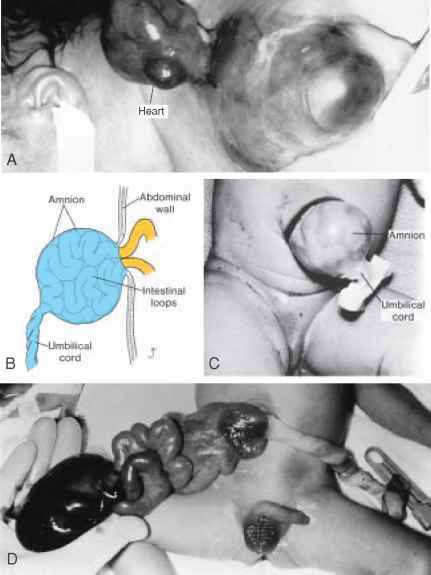 B. Omphalocele with failure of the intestinal loops to return to the body cavity following physiological herniation. The herniated loops are covered by amnion. C. Omphalocele in a newborn. D. A newborn with gastroschisis. Loops of bowel return to the body cavity but herniate again through the body wall, usually to the right of the umbilicus in the region of the regressing right umbilical vein. Unlike omphalocele, the defect is not covered by amnion. Figure 10.4 A. Scanning electron micrograph showing the ventral view of a mouse embryo (equivalent to approximately the fourth week in human development). 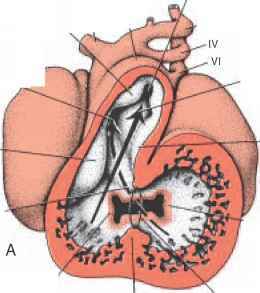 The gut tube is closing, the anterior and posterior intestinal portals are visible (arrowheads), and the heart (H) lies in the primitive pleuropericardial cavity (asterisks), which is partially separated from the abdominal cavity by the septum transversum (arrow). B. Portion of an embryo at approximately 5 weeks with parts of the body wall and septum transversum removed to show the pericardioperitoneal canals. Note the size and thickness of the septum transversum and liver cords penetrating the septum. C. Growth of the lung buds into the pericardioperitoneal canals. Note the pleuropericardial folds. Gastroschisis occurs in 1/10,000 births but is increasing in frequency, especially among young women, and this increase may be related to cocaine use. Unlike omphalocele, gastroschisis is not associated with chromosome abnormalities or other severe defects. Therefore the survival rate is excellent, although volvulus (rotation of the bowel) resulting in a compromised blood supply may kill large regions of the intestine and lead to fetal death. Cells of the somatic mesoderm lining the intraembryonic cavity become mesothelial and form the parietal layer of the serous membranes lining the outside of the peritoneal, pleural, and pericardial cavities. In a similar manner, cells of the splanchnic mesoderm layer form the visceral layer of the serous membranes covering the abdominal organs, lungs, and heart (Fig. 10.1). Visceral and parietal layers are continuous with each other as the dorsal mesentery (Fig. 10.2, C and E), which suspends the gut tube in the peritoneal cavity. Initially this dorsal mesentery is a thick band of mesoderm running continuously from the caudal limit of the foregut to the end of the hindgut. Ventral mesentery exists only from the caudal foregut to the upper portion of the duodenum and results from thinning of mesoderm of the septum transversum (see Chapter 13). These mesenteries are double layers of peritoneum that provide a pathway for blood vessels, nerves, and lymphatics to the organs. The septum transversum is a thick plate of mesodermal tissue occupying the space between the thoracic cavity and the stalk of the yolk sac (Fig. 10.4, A and B). 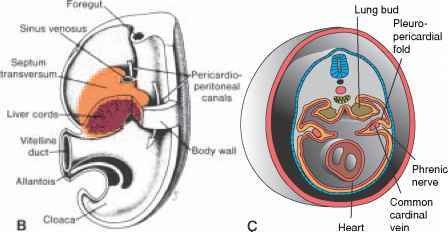 This septum does not separate the thoracic and abdominal cavities completely but leaves large openings, the pericardioperitoneal canals, on each side of the foregut (Fig. 10.4B).